The Peter Stone Company and the Certified Horsemanship Association (CHA) have announced the winner of the annual CHA Stone School Horse of the Year award. The honor went to a horse named Doc from Golden Gate Vaulters based in Golden, Colo.. Doc is owned by Noel and Yossi Martonovich. The Doc model, created specially by the Peter Stone Company, was presented as the special prize. The ceremony took place in Orlando, Fla., at the CHA International Conference. 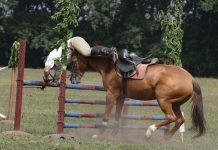 Doc is a 16-year-old Belgian gelding that has been a vaulting school horse for more than a decade. 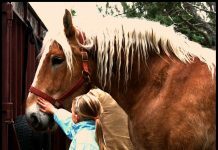 He came to Little Spring Ranch in Golden, Colo., from an auction when he was 5-years-old. Doc has competed at every American Vaulting Association National Championship since 1997 and several vaulters have won national titles on his back. Doc competed in the 2002 World Equestrian Games in Jerez, Spain carrying two vaulters from the US. He has been used for CHA vaulting clinics and has helped spread the sport of vaulting throughout Colorado and the US by being the patient mount of many new vaulters. Doc is truly a gentle giant.